When two wild adventure loving humans come together anything is possible, meet Alice and Ángel. Alice Forrest is a marine biologist, conservationist, and wanderer from NSW Australia, who made Byron Bay her home. Ángel Grimaldi is a wildlife veterinarian, adventurer and photographer from the Canary Islands in Spain. These two star crossed lovers are a match made in eco heaven, and after just a few days of living together decided to simplify their lives, buy a Toyota Land Crusier and adventure around Australia. How did they meet? Alice and Àngel first 5 years ago in Costa Rica. They were both volunteering on sea turtle conservation programs in the Ostional National Park. After a four year gap, they were reunited in Spain last year. Alice was chasing dolphins in the Azores, and Àngel was working as a vet in an aquarium. They hired a van and road-tripped the north east coast, during which they fell in love. Soon after Àngel joined Alice in Australia. Just a few weeks after Àngel arrived in Oz, the two pooled their resources and purchased Ohana- a Toyota Land Cruiser 4 x4 (which they fondly named Ohana- a Hawaiian word for Family). 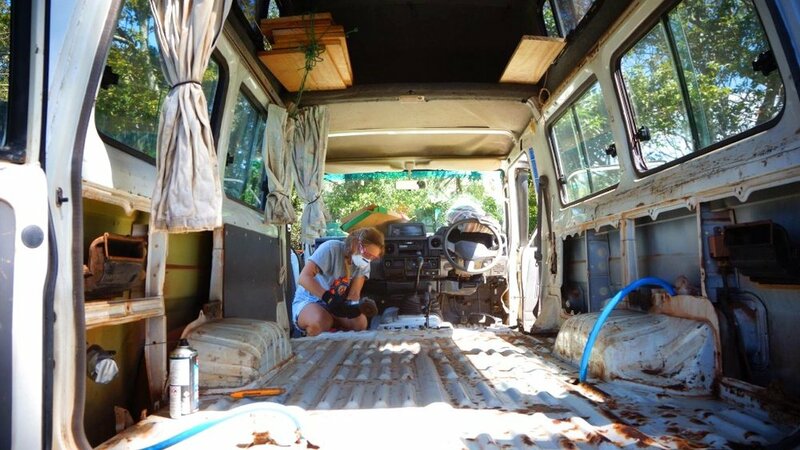 They worked tirelessly for two months on fitting out the Landy- Ohana in preparation for her big adventure. Using recycled materials whenever possible they minimized waste and reduced their costs, the outcome- a clean, eco efficient and road worthy home on wheels. I caught up with Alice and Àngel right before they left Byron. They were fresh with excitement, filled with hope and a most contagious optimism. It was a rainy afternoon which only brought more delight to Alice and Àngel, as they relished in the opportunity to finally enjoy the new home they created. We shared tea, stories and hugs. Alice has always inspired me, and as we grow closer my admiration of her integrity, intelligence and vigor for life increases. It is wonderful to know these two beautiful souls found one another. Like their lives of passion, Alice and Àngel's adventure is born from love, their original intention- to cross the Nullabor and head north up the Western Australia coast to Esparence. My interview finds these wanderers some where quite unexpected, read on to find out where they are now, what living in out of your car is like, and how to keep following your dreams. Right now we're in Sulawesi!! Our latest Visa run was from Perth to Indonesia, so Ohana is parked at a friends place and we're currently in transit (which is why we have wifi ). Just spent a couple of weeks on a remote island in the Wakatobi group where we met sea gypsys!!! Next step Bali and Nusa Lembongan for freediving, then home to Ohana at the end of the month. How is your vanlife going? Have any unforeseen challenges come up? Van life is pretty great, loving it so far. Decluttering and getting rid of a lot of our stuff has definitely given us more freedom. Takes a lot less time to decide what to wear, and it's easy to access the things we need the most, like freediving fins, snacks etc. Things that I thought would be annoying, like unfolding the bed every night, have turned into routines that I actually love. Plus we've added simple routines that make every day beautiful, like our morning coffee (brewed on the stove and drunk out of our favourite cups). *Ohana's running great and has already taken us to some amazing places! - The fridge - its old, and drains all our solar power, especially with the unseasonal rains we keep encountering. Luckily Exmouth, our next destination, has plenty of sunshine! - Getting our plants across borders. Our Aloe Vera lost all its soil but is doing well. Basil didn't make it. One unexpected perk of minimalising to is that everything we own now is my favourite - my favourite mug, blanket, swimsuit, knife, etc. We culled everything we didn't need and we're left with just the things that make us happy whenever we use them). What was it like crossing the Nullarbor Plain? To be honest, the Nullarbor was not as tough as expected. Between the two of us we drove extra long days (one day was almost 800km), listened to a lot of TED talks, and spent a lot of time looking for camels (didn't see any, just a lot of flat scrubby plain and the occasional wrecked kangaroo or car). The petrol stations were a lot more interesting, and a lot more expensive, than expected. They featured whale sculptures, snakes in jars, grey nomads, and Emu Lager (which tasted amazing at the end of 800k's of driving). The highlight was definitely the Straightest Road in Australia, and the cliffs of the Great Australian Bite. Temperatures ranged from meltingly hot to beanie-and-a-woolly-blanket cold. Other than that it was fairly uneventful, the best bits were either end of the Nullabor! On the way across South Australia we saw amazing plains and sunsets, and visited friends in the Eyre Peninsula. We camped on the side of lakes and metres from the ocean. We also chased some elusive leafy sea dragons, and introduced Ángel to the world-renowned Australian delicacy, Hot Chips with Pineapple Fritters. Then Esperance and the pristine waters of Twilight Cove at the other end. Is there anything that happened along the way to change the way you feel or think about living a nomadic life in your automobile? Ángel:: Luckily our months living in a van prior to the Troopy prepared us pretty well for an extremely close and personal living situation on wheels. Nothing has really changed - i still feel like life is good in our rolling home as it gives us more resources to spend on what makes us happy (like organic fruit and veg, or this trip to Indonesia), plus the mobility to visit friends and have adventures. The facilities of the truck, the kitchen and fridge especially, have made life easier but overall im still just enjoying the freedom of a nomadic existence. Alice:: the nomadic existence has been a welcome break from all the months of working (to save up for the nomadic part). Also being able to explore, especially four wheel driving, has made me love van life even more. We've become experts at analyzing GoogleMaps for out of the way roads that bump along to private beaches, or incredible viewpoints with the whole Milky Way above us, or sandy tracks to the edge of the water. I love having unique and beautiful views, changing every day. And I love being able to look over our feet, snuggled under a blanket, and see the sea. Do you have any advice for people who are thinking about living the Vanlife? Still just what we spoke about, making realistic plans (but with a healthy dose of imagination). And then just doing it. Going for it and making it happen. A lot of what you need gets discovered along the way. Ángel also says that it's important to remember that van life isn't forever, and that living without a toilet or whatever other obstacles are in the way shouldn't stop people from just giving it a go. One day we hope to have a bit of land, a tiny house (ideally a treehouse), a veggie garden and some rescue animals. Sometimes we daydream about it, especially when we get stuck for food and have to visit chain supermarkets for our veggies, and we remember that one day it will be different. Even for lifetime van-lifers there will be new and different vans, everything is impermanent. Has living together in your car affected your relationship? If so how? Ángel:: Yes, positively. Living together all the time in a tiny space pushes you to put forward your best side all the time, develop your empathy, helps you to be flexible and adaptable, and to play several roles (like best friend, person to listen to problems, chef, debate opponent). Alice:: Agreed. Being on the road and away from our close friends in Byron means that Ángel is now not just my best friend, but also all my other friends, plus boyfriend, plus mechanic, plus caretaker on the crappy days, plus chief adventure buddy on the awesome ones. It obviously brings you closer in a physical way (that only those who have lived in a van with no bathroom facilities will understand), but also has made us dependent on each other in a positive way. We're both very independent people, who are happy on our own, but we've found this rhythm or lifestyle where we are just having way more fun together, and living in a van is the best way to experience that. Do you have final destination in mind, or is this trip more about the journey? Ángel:: the destination is Ningaloo Reef, to see the migration of the biggest creatures on earth (we're hoping for whale sharks and humpback whales). But the fact that we have a destination doesn't mean that's the end of the project. Who knows where we'll go from there? Our whole plan was to develop the car, then explore some wild coastlines on the way to join the migrating whales. After that we're open to anything! Alice:: While Ningaloo is as far as we've planned, the journey is the real adventure. There are so many epic spots to check out along Australia's coast, and so much to explore. This is also a time to figure out where we want to go next, and what to do with our lives. When Ángel arrived in Australia, we just wanted to see if we were happy together. Then we wanted to see if we could take this happiness and put it in an awesome truck and drive to Western Australia. Now we're deciding whether to keep driving, or run away to Central America, or go chase narwhals, or climb mountains in Patagonia. (And also, at some point, to factor jobs and visas into the situation) What better place to decide than in our beautiful rolling house on an amazing wild coast?! The destination will be awesome, but ultimately it's still part of the journey. Ángel:: Yep, this is just one step in a life philosophy. Right now we're on the road, taking Ohana and ourselves to Ningaloo, but it's giving us the tools and experience for what comes next.